DAY 30 - 30DaysOfAvoToast: Avocado Club Sandwich - AvoSeedo - Grow your own Avocado Tree! When thinking of a sandwich the club is a perfect example of a classic! With just 5 ingredients, this is a sandwich combines meat, vegetables, and a little dressing. With such a quick prep time this recipe is worth making and thoroughly enjoying! Prepare the avocado mayonnaise: Put the egg yolk into a bowl and add mustard, lemon juice and salt. Start mixing everything together and slowly add the avocado oil until it has the consistency of mayonnaise. Cut chicken breast, hard boiled egg and avocado into slices. Arrange 3 bread slices in a row. Spread 1 tablespoon mayonnaise over 1 side of each bread slice. Place a lettuce stack on top of the first bread slice, top with grilled chicken and bacon, and season with salt and pepper, to taste. Place avocado, hard boiled egg and tomatoes on second slice of bread, season with salt and pepper. Carefully place the second layered bread slice on top of the first layered bread. Cover with the third bread slice, mayonnaise side-down. 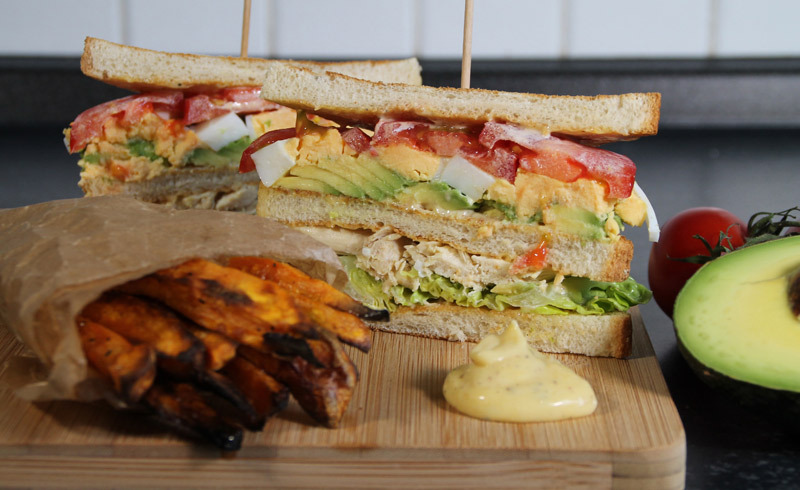 This entry was posted in Recipes and tagged 3daysofavotoast, Avocado, avocado mayo, avocado mayonnaise, avocado oil, avocado toast, Bacon, club sandwich, Egg, lettuce, Mustard, sweet potato, sweet potato fries, tomato.